nyc – Technology… in PLAIN ENGLISH! ➡️ Follow @HeavenBeatbox on Twitter! ⬅️ So one day in the future we’ll look back on these backward-image Snaps⬇️ and know it’s OG Snapchat?? LOL! Fix it, already! C’mon, man! Here are some pieces I made for #hustleNY. Loved working with @chrishallnyc on this. Taken via: the Huawei Google Nexus 6P smartphone. ICYMI: We interviewed @saradietschy about where ~THE HUSTLE~ came from. And yes that’s “Bill Nye The Science Guy” walking with him! LOL! Happy Chinese New Year 新年快乐 (歲首4715 春節) ⭐ Jan. 28, 2017 ⭐ with a surprise family tech twist! When: Starting today (Nov. 21, 2016) until Dec. 31, 2016.
:::IMPORTANT::: Spectacles are compatible with Android devices running Android 4.3 and higher with BLE and Wi-Fi direct capabilities only. If you have an iPhone, it must be an iPhone 5 or better running iOS 8 or better. Q: So for a person who downloads Cheekd, what can they expect? A: In this age of tech we’re in, it’s rare for people to say “hello” to one another. You don’t really see singles picking each other up at bars anymore, which pretty much used to be the only way people were able to meet in New York City. People don’t speak on the subway, at the gym or in cafes. Everyone is constantly looking down at their phones to connect with people in the digital world even though there’s a real world right in front of us. Walking down a New York City sidewalk is sometimes like playing dodge ball, and I feel people are missing opportunities because they’re not paying attention or simply looking up. The love of your life could be sitting right next to you, but you’ll never know if you’re too busy looking for Pokemon. If someone uses Cheekd and they’re staring down at his or her phone and the potential love of their life is behind them, there’ll be an immediate notification that another single is nearby. The app makes connections even if there’s no WiFi or cell signal, because it operates with a Bluetooth/ Beacon technology which works in a plane, a train… everywhere. Q: If the Cheekd app gets misused, is there a way to block people? A: Yes. As a matter of fact, Apple’s App Store won’t even approve an app unless you provide your users with that option. On our first submission to Apple, we overlooked it and got rejected. After we fixed that, we resubmitted and got approved. Q: I love how you think outside the box. Have you always been creative? A: My creativity has definitely been fruitful in building Cheekd. I’ve always been really creative. I was trained as an architect and before that I considered myself an artist and now I’m in the world of apps! I’ve always been kind of quirky, doing things in different ways, and I think it’s come in handy because I can get crafty when I need to tell the world what I’m up to, and on a shoestring budget. The way I’ve been able to get press coverage for example – I’ve been covered in publications every entrepreneur would dream of being in. I’ve been in Forbes multiple times, the Wall Street Journal, the New York Times, Fast Company, Inc. Magazine and countless others. And none of this was through a PR company – these results are from my creatively telling a story, reaching out to journalists and doing kooky things to get people’s attention. With limited money to market, creativity is one of the easiest ways to get under a journalist’s nose. Q: Is Cheekd on Android yet? A: Not yet, but we’ll get there. We released a new version of Cheekd on August 10th and we’re just ironing some stuff out before we roll onto the other platforms. 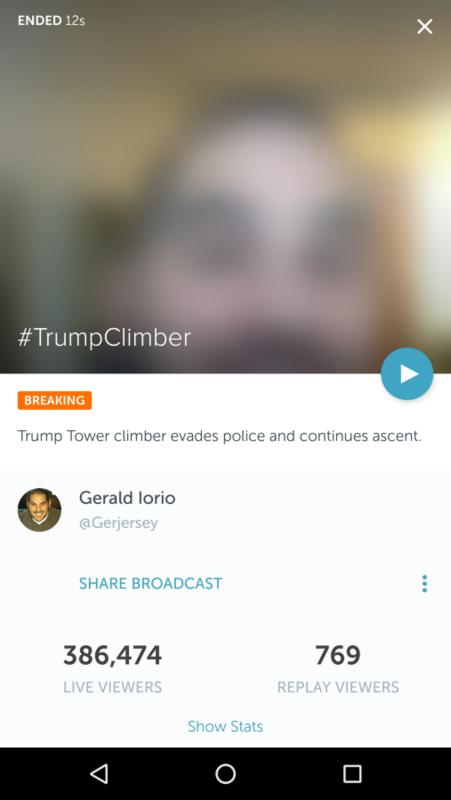 Q: Can Cheekd users filter what notifications they get? How complex are the filters? A: Yes, you set whether you’re looking for males, females or both, then you set your preferred age range, and you’re ready to go. We like simplicity in the filters because once you start filtering too much, it might be difficult to start making connections with people. Our app quickly lets you get active in meeting new people in real life with just a few preferences. 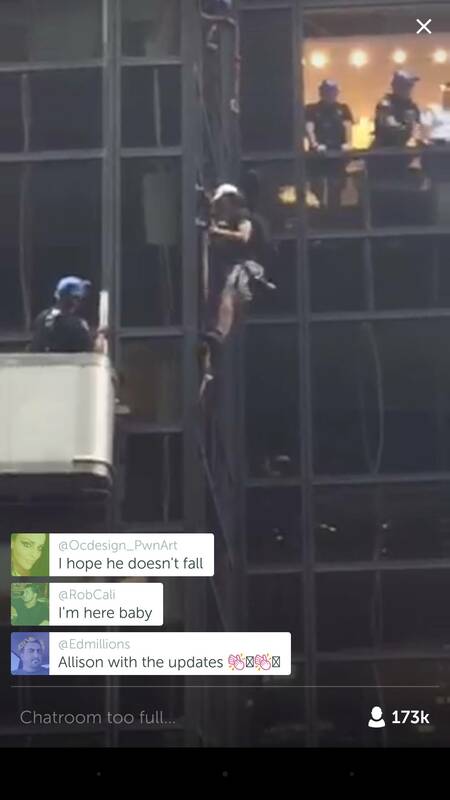 Just now: Man tried to scale Trump Tower in NYC! Cray-cray!! Addendum: On FacebookLive (user unknown) one broadcast had over 220K concurrent viewers. Let me tell you, heavy rain was in the forecast, and fortunately for the climber, the skies didn’t open up on him. That would’ve been bad.